What's New In My Zoo? I hope to post an update about my parrots every Friday, complete with pictures. who lives with me (December 2007). Orpheus has been busy this past week, destroying or trying to destroy nearly every material object that I own and behaving in an aggressive manner towards me, so — sadly — I clipped his primaries to prevent him from flying freely around my apartment. It made me sad to take away his gift of flight, even though this is only a temporary deprivation, but the improvement in his mood was nearly instantaneous. 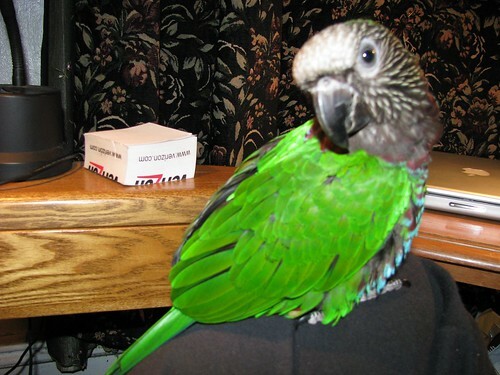 Further, like all pets, he needs a job, so I plan to clicker train him to perform tricks, and thus, he must be clipped so he will focus on the tasks at hand (learning new behaviors) rather than flying all over the place and chewing up my curtains, for example. 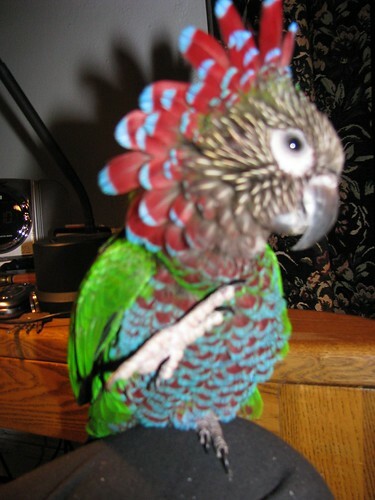 Even though the above image is a bit blurry, i like it because it gives a sense of the movement and life in this sweet parrot. The image below was taken with a flash. Here, surprised by the flash from a previous picture, Orpheus pauses momentarily from his head-scratching, foot up, and looks at the camera. As you all might be able to tell, I have probably learned everything I can about how to use this camera by simply playing with it. Now, I need to spend some serious time reading the manual and, you know, actually learning how to use its special features such as optical zoom and image stabilization. This entry was posted in My Pictures, Pets and tagged behavior, Deroptyus accipitrinus, hawk-headed parrot, red-fan parrot. Bookmark the permalink. 0 Responses to What's New In My Zoo? In the final photo, isn’t he saying “No photos”? you think?? i thought he was offering to give autographs. Oh, he’s gorgeous! That adolescent stage behavior is one that most dogs go through, too. But it’s typically when they no longer look puppy-ish, haven’t been obedience trained,and then start destroying everything in their realm. It’s also when they are most likely to be abandoned by owners and land in shelters. I think your strategy to begin his education is a great one. And the photos – thank you from me, too to your camera benefactor. We are all enjoying the photos! Wow, what a wonderful bird! 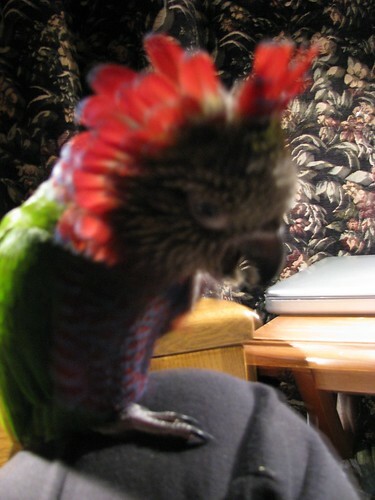 My Conure used to wake me by preening my eyelashes. Mmm, talk about a lovely way to awake. It’s amazing how those sharp, strong beaks can be so incredibly careful and gentle. He’s beautiful and such a ham! I had no idea hawk-headed parrots are so colorful. Wow! Judging from the pictures, I would conclude this bird has a mind of his own. Wow. How colorful he is. I like the flashless one – the expression on his face is sweet indeed. he’s gorgeous!How colorful he is.. I am sure can be controlled in birds. I have to augh. My 9 year old Granddaughter is here and keeping her self busy while I napped. She was on the computer and then went off to read The Hunger Games. When I got up Orpheus and your blog were on the computer. André is sitting right next to the computer. They look so much alike! Your friend mentioned that they are often abandonded at that stage. Poor André and was left in a tiny cage and ignored. He was all I can say is psychotic when I got him. He now sits on my lap for comfort expecially in the Hurricane and Nor’easter we just had. He lets us pet his beak with the back of our hands but not touch any place else. Still he will sit with me and kiss my face. I suspect sadly that someone must have hit him or his cage and he is afraid of fingers. Still after 3 years he is doing well and happy to sit beside my desk and preen and spend his days.